Power BI Custom Visuals have recently moved to Office Store. You can now find them here. To celebrate the occasion in a typical DataChant way, I have used the web scraping techniques that I had recently shared here and here, to prepare a Power BI report that automatically extracts the Custom Visuals’ names, description, links and images, and allows you to navigate through the different visuals inside Power BI. 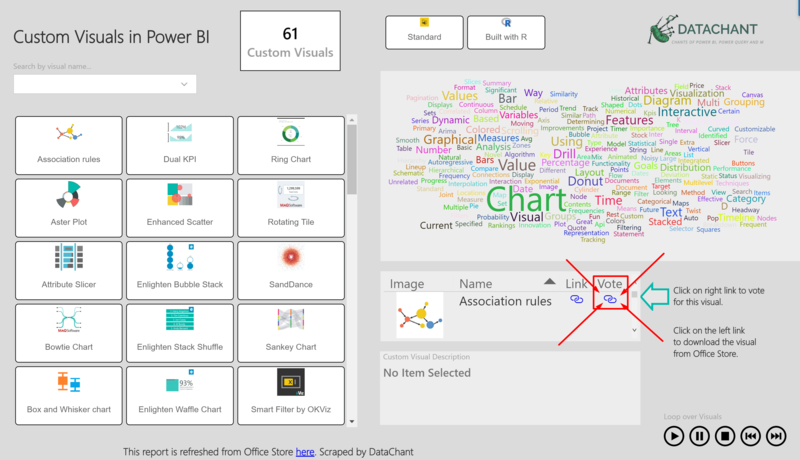 Check out the report below, and click on the Vote link to share your favorite Power BI Custom Visual on Twitter. Not sure how to vote? Here is the link icon. Click here to open the report in a full screen, and vote! You may notice that some of the visuals didn’t migrate yet to Office Store (as mentioned here by Microsoft). Get back to this page, as more visuals are migrated and released by Microsoft. You can now buy this report for $10 with your PayPal account, or credit card. My Favorite Visual is missing from it, “Breakdown Tree” wish someone could build it. It would be perfect if you are willing to share the pbix file with us. Now you can download it in the Subscriber’s Corner. @Gil, when I try to download the .pbix file it is asking me for password to enter. Could you help me ? Please subscribe to DataChant and you’ll get the password to access the download page by email. I got the password and was able to load the report and the base data, but was never asked for a password. Then when the report came up, and PBI wanted to refresh the data, I got a choice box with several options (many of them required a User Name and Password. so I knew the Password, but didn’t know which of the several options to click, and what User Name to use. What am I not doing correctly? Please go to File->Options and Settings->Options and check “Ignore Privacy Levels…” in Privacy. Now refresh again. BTW, did you obtain Text Analytics API?